WASH and dry thoroughly 1 ½ cup packed, lightly crushed basil, mint, tarragon, dill, or cilantro. Put the herbs in a wide-mouthed glass jar. POUR in 1 cup of canola oil or apple-cider or wine vinegar. Close jar. Put in a cool, dark place for 2 weeks. Swirl every day to keep leaves moistened. DECANT the oil or vinegar into a sealable bottle through a funnel lined with several layers of cheesecloth or a coffee filter to catch the leaves. PRESS leaves gently to get all of the liquid. 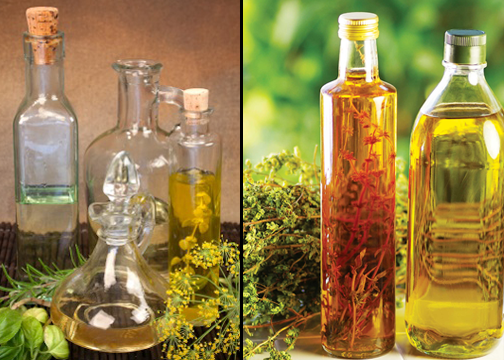 Cap the bottle, and store oil in the refrigerator up to a month or vinegar in a dark cupboard indefinitely. Oil—Puree the fresh ingredients with the oil in a food processor until finely minced. Let it sit for 30 minutes. Strain through cheesecloth or a coffee filter and use immediately or refrigerate. Vinegar—Warm (but don’t boil) the vinegar before pouring it over the fresh ingredients. Cover and steep away from light for three days. Strain through cheesecloth or a coffee filter and store in a dark cupboard. Ginger-apple (vinegar): 3 slices of fresh ginger and 1 cup chopped apple.